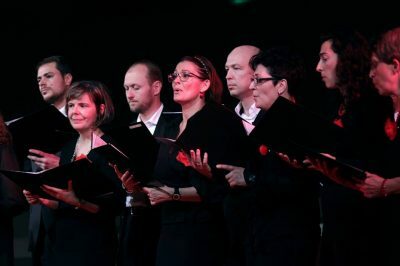 Founded in the summer of 2004 with the blessing of the Right Reverend metropolitan of West and Central Europe Simeon, the Chamber Choir of the Bulgarian orthodox church in Berlin is a skilled choral ensemble of almost 20 voices under the dynamic and enterprising direction of Boryana Velichkova, principal conductor and artistic director. The choir concerns itself mainly with a-cappella-music, in order to be able to concentrate on the work on a balanced sound-picture in pure tendency. The repertoire covers not only eastern orthodox music but also arrangements of bulgarian folklore pieces from Filip Kutev, Ivan Spassov, Petar Lyondev, Stefan Mutaftchiev, Atanas Naumov a.s.o. Apart from a regular concert activity and an advanced voice training of the choir members, the following choir activities should be mentioned. 2008 the Chamber choir took part in the International Choir Festival of Sacred Music in Pomorie (Bulgaria). 2009 was awarded a gold medal in the category Church Choirs at the International Choir Competition of Eastern Church Music in Bialystok/Hajnowka (Poland). In 2008 the choir registered as an association and became an independant concert choir in 2011. The choir members are multi-cultural, mostly bulgarians but also people from other countries, who have a love and appreciation for church music. We hope that with our music we can reach out to the hearts of the Bulgarians in Berlin and remind the with the power of the song of the beauty of our culture.